This major project to improve Church Web sites has been in process for the past few years to (1) upgrade the software and infrastructure to allow us to build Church Web sites more efficiently and with greater flexibility and (2) provide a redesigned, user-friendly look with navigation and content in languages and the ability to search across all Church Web sites. New home page with six channel pages. Site-wide search (Now all Web content is indexed, not just the Gospel Library). Gospel Topics (A new section with answers to questions about Church doctrines and practices). News and Events for Members (This is in addition to the Public Affairs site for media professionals). Prepare a Lesson or Talk (Consolidated resources to help you prepare a lesson or talk). A-Z index of Web site content (A “table of contents” to help you find information on Church Web sites). What’s New? (A document that describes the Church’s latest Internet efforts and what you can expect in 2006 and 2007). New scriptures interface in English (Spanish, Portuguese, French, German, and Italian will be added by the end of August 2006 and more languages after that). We invite your feedback about this test site. The old LDS.org is still available to use. However, sometime in the summer of 2006, we expect to replace it with this new release. Next week, we will release an enhanced Gospel Library with more content, more formats, and better search capabilities. Later in 2006, we will translate LDS.org into nine languages: Chinese, French, German, Italian, Japanese, Korean, Portuguese, Russian, and Spanish. We will continue to build the Gospel Library in these and more languages. 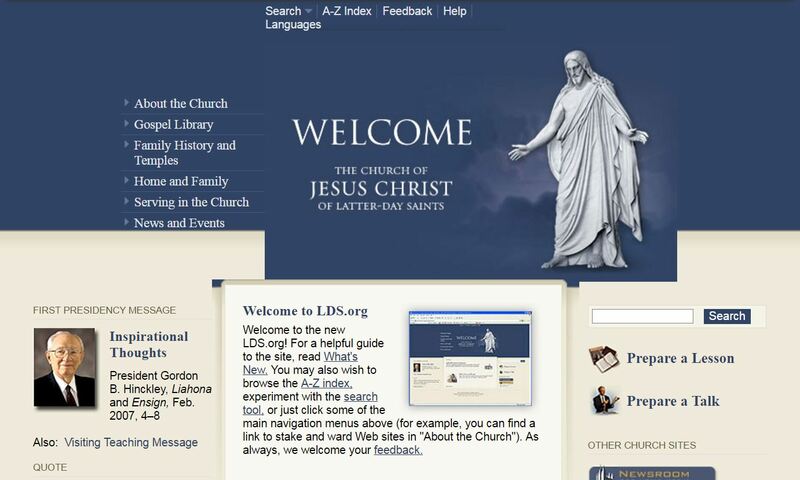 In the meantime, you can use beta.lds.org in English or refer to LDS.org to see the existing language materials. In 2007, we will redesign other Church sites to be similar to the new LDS.org. For the latest plans, see the What’s New with LDS.org? document. I’ve been really looking forward to the on-line version of the scriptures translated into Spanish. I read that this function would be out at the end of August. Is there an update about when this will actually happen? Do you know if the Church has a policy about people creating websites to host information about a church calling? For example, someone creates a Web site to track Duty to God where parents could log in to this Web site and update / view information about their boy\’s progress. To your knowledge has the Church said anything about this type of site? I am aware that the Church has a policy about stake and unit Web sites, but is there anything beyond that? There is no formal policy. To date, we haven’t linked to any of these sites from a Church site, and probably never will. As good as some of these sites are, generally the Church doesn’t like to be prescriptive on how a program is to be run and many of the sites for Duty to God, Scouting, Primary, etc. tend to be very prescriptive and also interpretive of the purposely basic guidelines provided by headquarters. When will the non-English scriptures be on-line? The Spanish scriptures should be online later in September, then other languages soon after that. my mouse in a natural way, the menu disappears by the time I get there. It may even pop up some other menu along the way! As far as user interfaces go, I think this is very frustrating. If I click my mouse, I expect things to happen and so they don’t surprise me. However, when I simply move my mouse, I don’t expect big things to happen (like pop up menus). My eyes actually get a little sore when this sort of thing happens. response to your click (so you can’t accidentally set it off by moving your pointer to the bookmarks menu, for example). Even better, the menu doesn’t disappear automatically either. It stays up until you either click on the intuitive little X button OR until you click anywhere else on the page, including the background. This is really intuitive, non-jarring, and simple. Accessibility is really important. I’ve been to many websites where a menu disappears before I can click on a selection or where I accidentally do the wrong thing because a menu magically popped up right on top of something I was about to click on. I would love it if this problem were addressed on lds.org. I vote for Andrew’s observation. 1. The Menu to the left of the Welcome banner works fine if you are running a high resolution screen, but not so well if you are running on a laptop. Screen real estate is important and in low res conditions the Z-order presents a problem with cutting off some of the bottom menu options. 2. Selecting from the same left menu is a frstrating experience with a track point, Wacom, trackball or low res mouse (especially a sensitive wireless one). About half the time, the menu retreates or the wrong menu options are selected if the mouse is not placed “just so” on the screen. My suggestion is to either enlarge the sweet spot, or simplify the menu presentation so that it is self-persistent and not dependant on exacting placement of the mouse/pointing device. I have found the problem tends to aggravate at 1600×1200 and above and below 1280×1024. 3. The Search option (child window) exhibits the same behavior. I would suggest more persistence there as well. 4. Too much dead space in the corners. The navy blue is a strong color and tends to draw the eye towards it. Thus the blank is perceived to be bigger than it really is. One suggestion is to use a filler of some type (maybe a visual flourish) that satisfies the need for a visual anchor or a border and allows the viewer to move on more quickly to the portion of the page with content. 5. Is there a reason 2 search areas are presented on the page? 6. The pringing at the bottom of the page is a bit small to read in high resolution 1600×1200 and above. This is probably not a major issue for many people. 7. I like the color scheme of the page, however, I would suggest that brown text over the taupe background may need more contrast, as the smaller it gets (with higher res), the more it “blends” into the background till it comes close to “disappearing”. This is what I found in the first 15 minutes. I hope this feedback is helpful in some way. Thanks for the feedback, ppenrod. You have some good comments we’ll consider. ppenrod, I agree with your comments, but I still think that “more persistence” isn’t the right way to address the problems with the left menu and the search child window. It seems to me that it’s much better to have child windows appear and disappear because of clicking instead of because of mouse hovering. Increasing persistence only fixes some problems, and it can cause others.